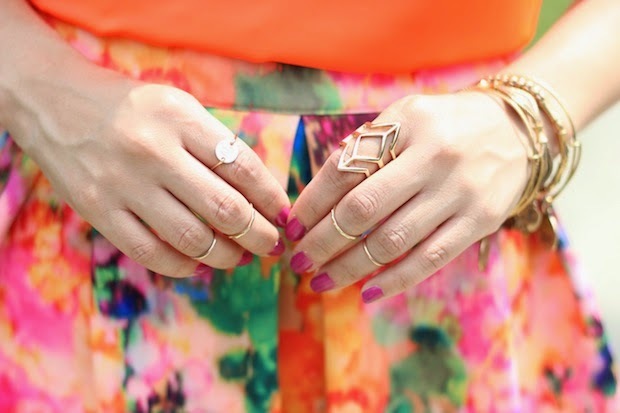 It looks like it’s going to be a colorful week here on the blog! With July coming to a close, I really want to take advantage of these last weeks of summer. I am definitely going to miss this weather, but I am also looking forward to fall fashion. It’s difficult for the camera to pick up on neon, so this top isn’t showing it’s true color in these photos. I got it on clearance for only $10 before my Miami trip. I love simple solid colored tops like this since they are perfect for pairing with printed pieces. Speaking of printed pieces, how cute is this skater skirt? I just can’t seem to get enough of them. They are so girly & fun for summer. I decided to pair this outfit with these chunky heeled sandals that I got at Kohls a few weeks ago. They’re a great daytime shoe if you’re looking for some height, but don’t want a thin heel. I decided to finish off the look with a high ponytail to keep it playful. Hope you all have a Happy Monday! Love this look Naty! Loving those shoes from kohls! Your skirt is everything, love your pairing with the top and your high-pony tail is just perfect for this look.